“What hath God wrought?” was a message that reshaped the world as we know it. Transmitted by Samuel Morse in 1844, it was the first message sent via electricity from Washington to the Baltimore telegraph field office. Communication could now travel faster than ever before. It makes the dawn of the Internet seem about as important as the launch of the latest iPhone. Yet the real innovation wasn’t Morse Code – it was enabling people to communicate more efficiently than ever before. The underlying technologies have come and gone, yet the job – communicating simply with certainty and speed – has remained. Today, we’re witnessing a similar dynamic. In the same way communication was open to everyone beyond those who knew Morse, software products and services are evolving without everyone knowing how to code. We’re constantly reading articles asking whether designers should code, or whether kids should be taught coding. But we shouldn’t be aiming for a future where everyone needs to code anymore than a future where everyone needs to be a mechanic in order to drive. When I started working I coded in C. You had to understand how memory was used and released. If you didn’t it meant there were memory leaks and your program crashed – which mine invariably did. When languages like Python and Ruby came along, you didn’t even have to worry about memory, or even the type of the variable. Other magical processes seemed to take care of that. Knowing how memory is allocated might make you a better programmer. But it doesn’t mean everyone has to know it in order to complete the basics. It’s like photography when the digital camera came on the scene. It meant people could take photos without worrying about focus or lighting in each shot. It democratized photography. 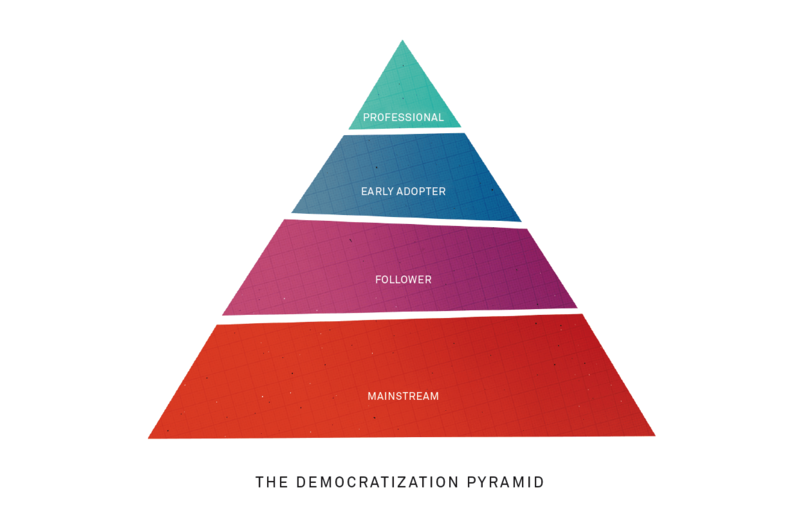 As technology moves through each phase of the pyramid, new opportunities arise. Today, digital and smartphone cameras have meant almost anyone can take, produce and store limitless numbers of photos at negligible cost. It’s resulted in hundreds of new technologies and businesses – from Flickr to Instagram. The power, ability and means to take and publish photos is now available to the many and not the few. We are already starting to see this shift towards a code-free future. Take WordPress. Before WordPress, creating a website was damn hard. It required understanding a number of different technologies – web servers, backend databases, and front-end configurations. WordPress created a product that allowed people without coding skills to easily create a website. People could focus on their problem, and not on the myriad technologies they needed to get their site up and running. The same goes for Dropbox. Before Dropbox, cloud based storage required people to interact with Amazon Web Services’ S3 via an API, and later through the AWS users console. Then Dropbox came along and made this process as simple as drag and drop into a folder synced across all your devices. Dexter lets you create an app from pre-made modules, without having to know any languages. All the above examples have created interfaces that allow people easy access to the underlying technologies. Everyday jobs such as storing files securely and building a website can now be achieved with little to no training required. The irony here is that developers are the gatekeepers to this code-free future. They can create interfaces that allow more people, without any coding knowledge, to create even more value within their products. It’s the multiplier effect of code. At Intercom we are doing this by helping people integrate with the Intercom Platform. We certainly won’t do this by trying to improve the coding ability of all our customers. Instead, we believe we can achieve this future through approaches such as enabling one-click development. Or eliminating the number of steps someone needs to take to start developing on Intercom so they can receive data within one or two clicks. Take our Facebook integration. We have made it easy for people to integrate Facebook with Intercom with just a few clicks. No need to write any code to get your Facebook messages sent directly to your Intercom inbox. Technologies evolve. Problems are timeless. There will always be a need for professional programmers. In the same way there will always be a need for professional mechanics. But we should be aiming to make it easier for people to access technology, not making code a requirement for solving everyday problems. Technologies come and go, but problems stand the test of time. We should be aiming to help people solve those problems as easy as possible. We still need to make this blog post available to a remote audience, but we are not transmitting it via Morse code. Anticipating these paradigm shifts is the difference between a 10x company that creates disruptive technologies versus a 10% company that iterates on existing ones. We’re betting that when a future without code comes around, we’re in the former camp. We’d love to hear what a code-free future might look like with Intercom. What might you build with the right support and the right tools? What value could you create for customers with a single click given the right developer ecosystem? Leave us a comment here, or drop us a note.